Adding another weapon to wield against Google in the smart home arena, Amazon announced Monday that it has a deal to acquire eero, a startup that has developed a mesh-based whole-home WiFi platform. 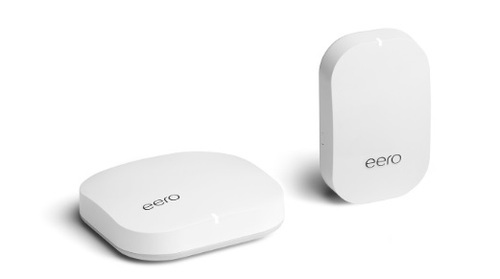 On both fronts, eero has been grappling with a crowded mix of home WiFi software and product players, including Google (Nasdaq: GOOG), AirTies , Hitron Technologies Inc. , Linksys, Netgear Inc. (Nasdaq: NTGR), Arris Group Inc. (Nasdaq: ARRS), Nokia Corp. (NYSE: NOK), Calix Inc. (NYSE: CALX) and Comcast-backed Plume Design Inc. The eero hub (left) and eero Beacon. Amazon said eero products have a 4.6-star product rating with the online retailer. eero's product lineup includes a central hub that, the company claims, can bathe an area of up to 1,500 square feet in WiFi, a smaller Beacon WiFi extender and software that uses in-home data and a cloud-based platform designed to help optimize the customer's WiFi network. eero Plus is a subscription-based security offering that keeps tabs on cyber threats and includes an ad-blocker. "We have a shared vision that the smart home experience can get even easier, and we're committed to continue innovating on behalf of customers," Dave Limp, SVP of Amazon Devices and Services, said in the release announcing the eero deal. Update: Mesh-style networking systems have emerged to help solve a "real consumer pain point over poor coverage in the home," Brad Russell, research director at Parks Associates , said in an email to Light Reading. "Most ISPs have not adequately addressed the problem so consumers are now plopping down more cash for systems that can cost from $250 - $350," he added. Citing Parks Associates data, Russell noted that 11% of US broadband households currently own a whole home mesh networking system, while and another 22% have purchased lower-cost WiFi extenders that don't generally solve the coverage or congestion problems. He said Amazon's acquisition of eero will give it "critical infrastructure for the connected home," and suspects that eero's roadmap involved adjacent areas that play into home automation services and cybersecurity (the latter is already being addressed partly with the eero Plus offering). Providing greater in-home coverage is "critical to all of Amazon’s initiatives," added Parks Associates Senior Director of Research Brett Sappington. Amazon did not announce what it is paying for eero, which has raised about $90 million, according to Crunchbase. Amazon (via the Alexa Fund) was also a backer of Luma, a WiFi company that was acquired last year by First Alert. The acquisition comes about a year after eero laid off about 30 employees or 20% of its workforce. At the time, eero said it had eliminated an unannounced product so it could focus on its "core business" of home WiFi.